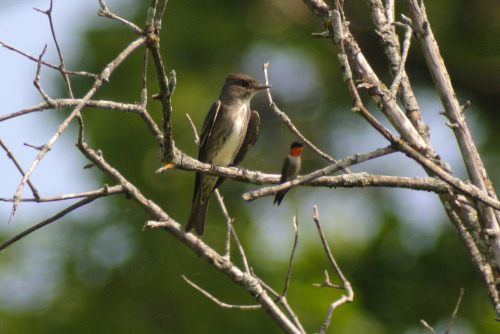 Olive-sided Flycatcher (Dane County year bird #231), photobombed by a proud Ruby-throated Hummingbird. He had been reported at Los Alamos County Park, which was sort of on the way for my trip home, so I stopped in to see if I could find it. It was very windy, which had the birds under cover and made it hard to hear vocalizations, but it still was fun (fact: birding is always fun). I’d given up and was walking back to my car when I saw a bird fly to the top of a tall radio antenna on a hill west of the park. It was pretty far away, but in the binocs I could see the short tail, big head, and white belly contrasting with the dark sides. Yay! The universe rewarding me again! 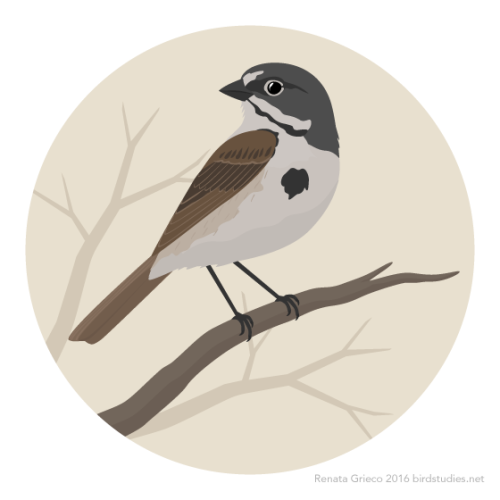 Found in sagebrush, chaparral, and other scrubby, open habitats of California and western Arizona, these birds and the Sagebrush Sparrow were previously considered the same species. First known as Bell’s Sparrows, then split into two species, they were lumped again as the Sage Sparrow in the 1950s, before being split once again. 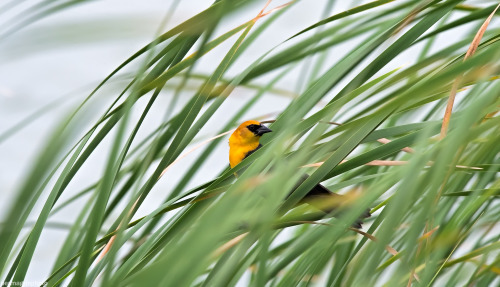 They eat seeds, insects, spiders, small fruits, and vegetation in the breeding season and mostly grass and other plant seeds in the non-breeding season, foraging mostly on the ground. Females build open cup nests in or under shrubs, from twigs and grasses, lining them with fine grasses, thin bark, feathers, wool, and hair. 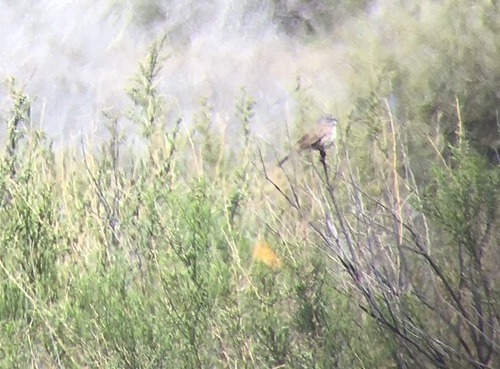 I’d seen their previous conspecific Sagebrush Sparrow on our Mammoth trip, so I knew what to look for. These shy LBJs are hard, though. At the Cuyama Dairy, two females mixed in with the hundreds of Tricolored Blackbirds and assorted Brewer’s and Brown-headed Cowbirds. 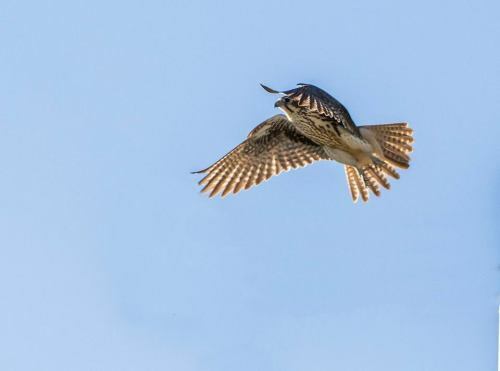 Prairie falcons in flight in Arizona. Top photo is a wild bird (we think juvenile, but not positive) and bottom photo is a young bird being trained for falconry. She was trapped a few weeks earlier and this was her first free flight training session. There were tons of prairie falcons in Arizona during my trip. On the first day we were there, Kai refused to hunt with us because a wild prairie was hunting nearby (we didn’t know this until afterwards). 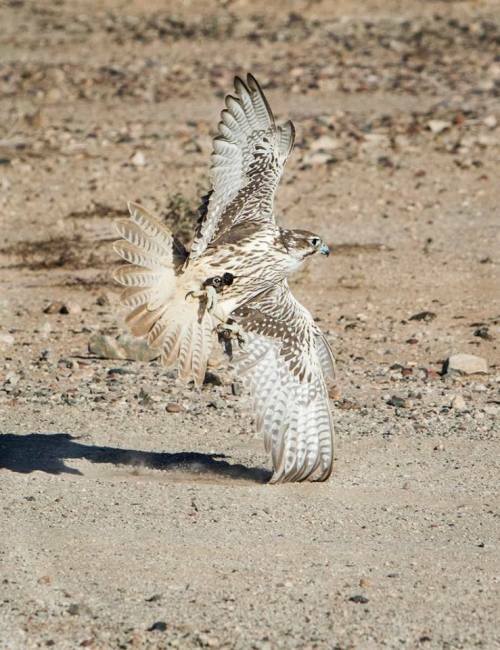 A forest-adapted goshawk out in the open desert is no match for a prairie falcon in their natural habitat, so he took off towards the cover of neighborhoods and led us on a tail chase for 10 minutes. It took a lot of convincing to get him to come down. It was scary, but also so fascinating seeing how different species interact with each other. This was the bird I was most hoping for when I made the last-minute decision to head to Cuyama yesterday. Since it was a solo trip I couldn’t spare too much attention from driving, but what I could was dedicated to scanning telephone poles and prominent rock piles and anything biggish and flying for the slim figure of a big falcon. Until mid-morning today it was mostly Common Ravens (Edgar would have liked them), some Red-tails, and a few Swainson’s Hawks. And then, as I was driving along Foothill Road toward the dairy where I planned to look through blackbirds in hopes of a Yellow-headed, I saw it: Trim and fast, pointed wings but clearly way bigger than the kestrel I’d seen earlier. I braked and got the car to the side of the road, jumped out and raised my binoculars, but even without them I knew it was good; the sandy color and black axillaries looked just like the Prairie Falcon I’d seen near Bridgeport on our Mammoth trip last month. The bird was chasing a raven that had something in its beak. After a few seconds the raven dropped whatever it was and the Prairie Falcon grabbed it in its talons and flew off screeching. I don’t know if the falcon was robbing the raven or just stealing back something the raven had stolen first. 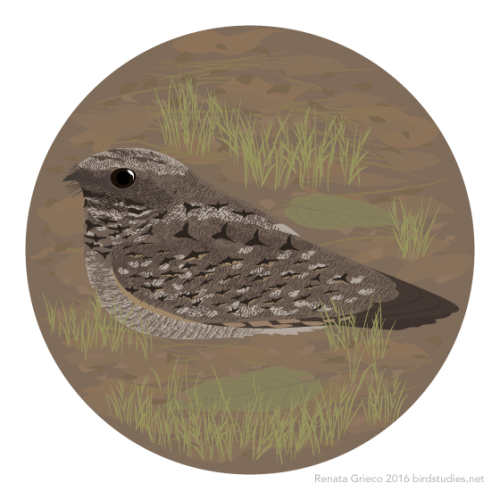 These small nightjars are found in dry grassy or shrubby areas of western North America. Foraging mostly at dawn, dusk, or on moonlit nights, they catch insects in the air, making short flights from the ground or a low perch. During cold weather, when the insects they feed on aren’t active, they can enter a state of torpor, dropping their body temperature and slowing their metabolism. Females lay their eggs directly on bare ground, gravel, pine needles, or dead leaves without building a structure. Both parents feed the chicks with regurgitated insects and can move either the eggs or chicks to a new nest site if they are disturbed. The down-covered chicks can move around by hopping or somersaulting. You are currently browsing the Carp Without Cars blog archives for April, 2018.